They say that small is beautiful. Although Paris has some of the finest palace hotels in the world, occasionally I like my luxury to be on a more intimate scale. This can pose problems, as the smaller establishments do not necessarily occupy the most desirable locations. Thus my delight was intense when I discovered a tiny new luxury hotel sited in a quiet street between the Champs-Élysées and my favourite Parisian thoroughfare (where, should the fancy take you, you can pop into a shop and buy a Monet) – the rue Faubourg St-Honoré. In this convenient spot, not only does the Hotel Daniel offer refined comfort: it also has a young chef of remarkable talent. 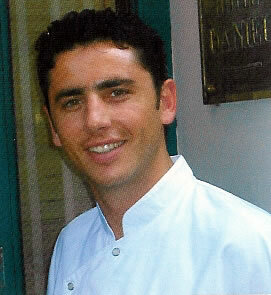 I first met Denis Fetisson (pictured) when he was manning the stoves at Incognico, in London. He seems happy to be back in his native France, and – with happiness – has come a full blossoming of his considerable skill. 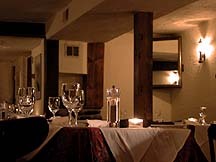 I sat in the little dining room, a chamber of dark colours, whicker chairs and spotlights, and certainly thought that I was in for a good dinner. 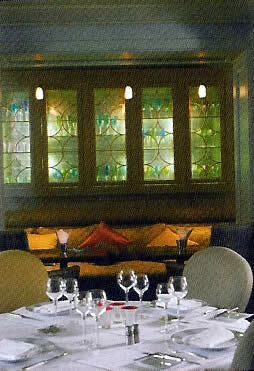 The Bernardaud crockery and Christofle cutlery indicated that someone really cared for this place. (Incidentally, if – like me – you prefer upright chairs for both yourself and your companion, you should ask for table number 8.) The wine list was, admittedly, very short – only 32 bottles, all French – but the offerings seemed well-chosen and attractively priced (with Cristal champagne at 180 euros). And the service, from the dark-suited and suave Lionel Laisney, was courteous and professional. Yet nothing prepared me for the food which was to come. I confess that I was truly astonished at the brilliance of Monsieur Fetisson’s cooking. First came several excellent appetizers. Normally, I rather take these for granted, but one – slivers of scallop with black truffle – made me sit up. Was this a sign of great things to come? It was. My first course was asparagus, with a sabayon of preserved tomatoes. A straightforward dish, but the painterly presentation and the precision of the cooking elevated it into something special. And then a dish of rare brilliance: a ragoût of vegetables, with truffles and small, herb-filled, pasta squares. Such harmony and delight for my taste buds invariably indicates precision and iron discipline in the kitchen. Wonderful. Next, pink veal – tender and full of taste (Mr Fetisson has, clearly, found a good supplier) – well-balanced with a jus with Seichuan pepper, and accompanied by a tiny basket of young vegetables. Each element was spot-on and each made its contribution to the whole. By the time the delightful pudding of soft chocolate and fromage blanc sorbet appeared, I was convinced of Monsieur Fetisson’s exceptional abilities. (86 euros for these four courses.) This meal deserved one Michelin star – at least. 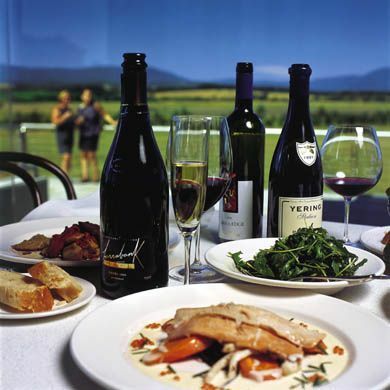 My drinking began with a white wine from Bordeaux, from one of the most famous producers of claret. This 2000 Domaine de Chevalier (88 euros) provided suggestions of apple and pear, with good acidity and a creamy aftertaste. My red was from Burgundy, and straightforwardly yielded lots of soft, red fruit (Corton, Les Bressandes, Domaine Chandon de Briailles, 1996 – 85 euros). I enjoyed these bottles, but there is no doubt that Mr Fetisson’s kitchen deserves a much more substantial cellar, and perhaps also some Riedel or Spiegelau glasses. I have mentioned that the Hotel Daniel is small. In fact, it has only 26 bedrooms. Mine was on the first floor. 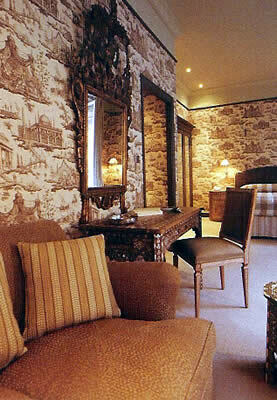 Room number 101 was in the category I think you will want here – a junior suite (490 euros a night, breakfast extra). I found this apartment elegant and very comfortable. From a small hallway I entered the air-conditioned bedroom. 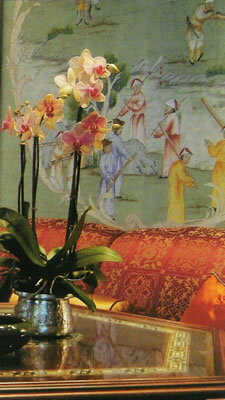 A sense of the Orient pervaded – as, indeed, it pervades the entire hotel, for the prevailing style is the Chinoiserie of the 18 th century. The writing desk and the bedside cabinets were covered with elaborate carving, and the fabric of the walls had Oriental scenes picked out in burgundy on its grey background. I liked this colour scheme and I liked, too, the ample seating (for up to 8 people). I found it easy to create a restful atmosphere from the mixture of spotlights and table lamps, and the large mirror (too often absent from hotel bedrooms) enabled me to ensure that my tie was always straight. The bathroom was modest in size, but the clever use of mirrors created a sense of space. It certainly did not feel cramped as I undertook my pre-prandial ablutions. Its chromium fittings sparkled against the grey marble, as I spooned into the tub bath salts from the Dead Sea. From the four types of Molton Brown shower gel on offer, I selected the ‘Cool Menthol’. As I soaked, I noticed that on the wall was that bathroom item which always (for some reason I have yet to fathom) cheers me up enormously – a clock. This one was large and round and looked splendidly old-fashioned. A set of scales, which I did not dare to use, was also provided. Breakfast was served in the dining room. I recommend that you have the American version (28 euros), rather than the simpler Continental (20 euros), for then you will be able to enjoy, as I did, some tasty bacon, mushrooms and tomato. Indeed, everything with which I broke my fast (porridge, crusty bread, apple juice, croissant and marmalade) was of the highest quality, and it was all brought to the table. No exhausting buffet here. And special mention must be made of the silver pots containing the coffee. Of Art Deco design, they added a whiff of ‘30s glamour to my early mornings. And they re-appeared in the afternoons, when – as I nestled in a corner of the beautifully furnished lounge, next to the green, hand-painted, Chinese wallpaper – they held my Emperor Chen-Nung tea. 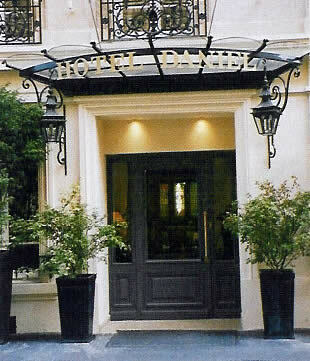 Wonderfully located, exquisitely decorated, supremely comfortable, and offering the cuisine of the brilliant Denis Fetisson, the Hotel Daniel is a magnificent addition to the hostelries of Paris. In this case, it is true: Small Is Beautiful. 8 rue Frédéric Bastiat, Champs-Élysées, 75008 Paris, France.